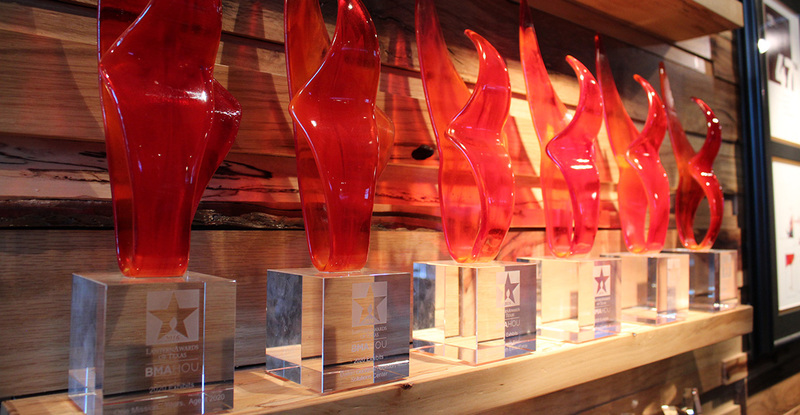 2020 Exhibits, announced today that it won the Business Marketing Associations’ 2016 Lantern Awards across six categories, including Small Tradeshow Exhibit, Corporate Re-branding, Vehicle Graphic, Tradeshow Campaign, Promotional Package and Fixed Installation. 2020 Exhibits also won the Award of Excellence across five categories, including Large Trade Show Exhibit, Website redesign, Corporate Video, Interactive Presentation, and Capabilities Collateral. Recognized for outstanding exhibit design, 2020 Exhibit won a Lantern Award in the Small Trade Show Exhibit category for Watlow Electric Semican West 2016. 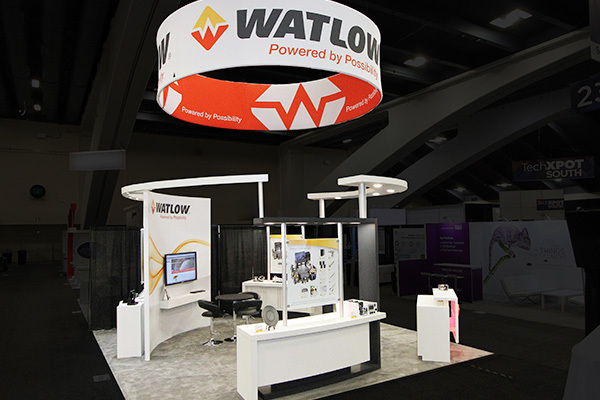 With a focus sharply aimed at contemporizing Watlow’s trade show exhibit with a lighter, re-configurable, modern look, the design team brought a curved look to the exhibit and brought out the sense of “heat” through a series of LED light placements. Red back-lit LEDs accented product displays, the logo at the reception desk and the curved features overhead. The fabrication focused on continuity, open space, and efficient use of material and technology. The monitors and interchangeable graphic holders allowed for flexible branding and messaging and sleek presentation with through video. A Lantern Award was earned in the Branding Category for ExhibitForce, the business ERP System that drives company processes and business intelligence with 24/7 access to real-time data. Key objects include an entirely new look, feel, and voice focusing on this tech-savvy brand while simultaneously-expanding the targeted client base beyond event marketers and F2F houses to include all companies that have complex operations and fulfillment. With a solid strategy and clear objectives, the design team built the brand from the ground up across a robust series of deliverables including an entirely new, responsive website; solid and clear value propositions; videos; print collateral; direct mail; e-communications and a new trade show campaign and presence. In the Fixed Installation Category, the Environments Team earned a Lantern Award for the inspiring and functional Daikin | Goodman Comfort Solutions Center. Designed by 2020 Exhibits to be more than just a showcase where HVAC dealers can see the latest indoor comfort products from Daikin, Goodman, and Amana brand, the Comfort Solutions Center (CSC) invigorates the more traditional product showroom experience. What was once considered a traditional, static learning environment is now a visitor-focused experience with a more welcoming, open and interactive feel. HVAC dealers can now get up close and personal with these product lines, along with a host of other high-efficiency indoor comfort products in an engaging, meaningful way. The CSC is a clear reflection of the company’s innovation and intelligent energy technology that has supported its growth to become the world’s largest manufacturer of HVAC systems and refrigerants. Increased engagement, education, and generating excitement were central to the success of this 3,000 square foot space. 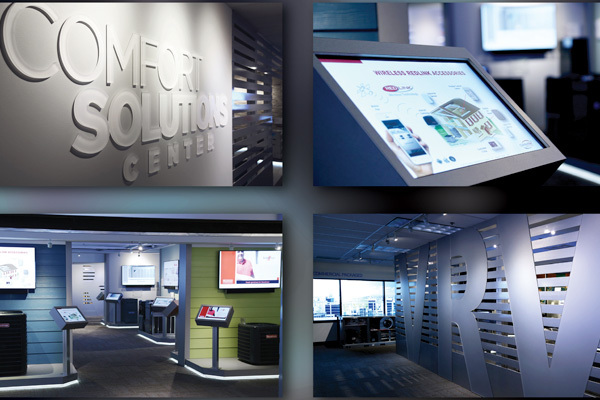 More than any other product showroom, the CSC delivers. On the road again! A Lantern Award was awarded in the Mass Transit/Wrap category for 2020 Exhibits’ Vehicle Wrap series, which is designed to leverage our fleet of delivery and service vehicles by combining the fleet’s presence on the road with a compelling message to achieve increased brand awareness. 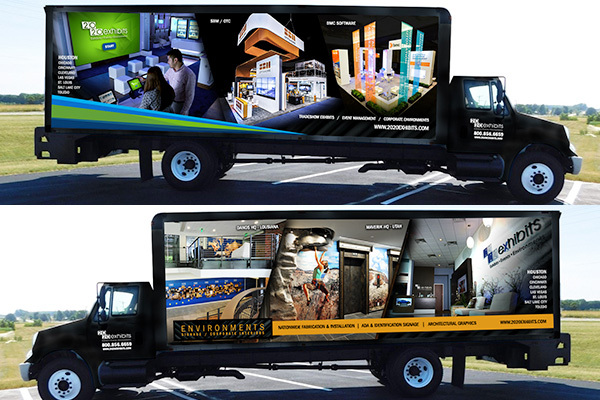 Utilizing eye-catching dimensional graphics on the sides of the delivery vans, each vehicle carries a distinctive design while maintaining brand continuity and identity across the fleet. 2020 Exhibits proudly won a Lantern Award in the Tradeshow Campaign category for the 2020 Exhibits at ExhibitorLive: Agent 2020 Campaign. As one of the largest tradeshows for the actual tradeshow industry in the world, ExhibitorLIVE is the place to shine! The creative team at 2020 Exhibits developed the theme of “Secret Agent” (AKA Agent 2020) and built a campaign utilizing a series of themed communications including pre-show, at-show, and post-show marketing. From concept to close, this multi-layered campaign and themed exhibit were very powerful in achieving 2020 Exhibits goal of attaining a set number and value of qualified leads and eventually closed deals. Touchdown! 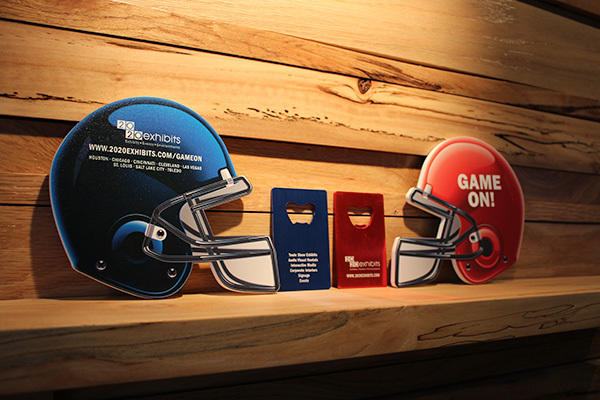 As part of a partnership agreement with the NFL’s Houston Texans, 2020 Exhibits is given the opportunity to promote their brand within the high-end luxury suites on game days via a leave behind a promotional item. Recognized for unique creative, 2020 Exhibits won a Lantern Award in the Promotion Category for the two-part “Game On” promotional package which includes custom-designed, branded and fabricated wallet-sized bottle openers and a custom Sintra helmet, featuring the capabilities of 2020 Exhibits’ printing and fabrication services. The football helmet served valuable real estate to communicate 2020 Exhibits’ value proposition and custom messaging drove users to a landing page for the “Game On” campaign. An Award of Excellence in the Large Exhibit category celebrated this flexible favorite, Wood Group Mustang. Seeking a modular exhibit environment that would be reconfigurable for any variety of show scenarios, the team at 2020 Exhibits produced a modular exhibit system that could service the client’s needs not only across a broad range of shows. Easily transformed from a 20’ x 30’ to a 40’ x 50’ without any design implementation, this flexibility not only saves logistics costs from show to show, but increases the life of the exhibit – yielding bottom line savings. 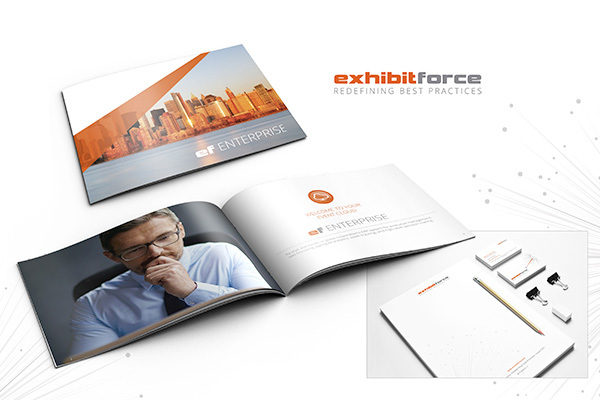 In the Website Category, an Award of Excellence recognized the compelling redesign of the ExhibitForce website. A comprehensive site that demonstrates the broad suite of the technology’s capabilities included extensive screen shots, demos, and videos illustrating the full breadth of functionality. The creative elements of the site came from new branding efforts that began months before the site build began. New brand guidelines included color pallets, fonts, layout conventions, and the building blocks of the brand. 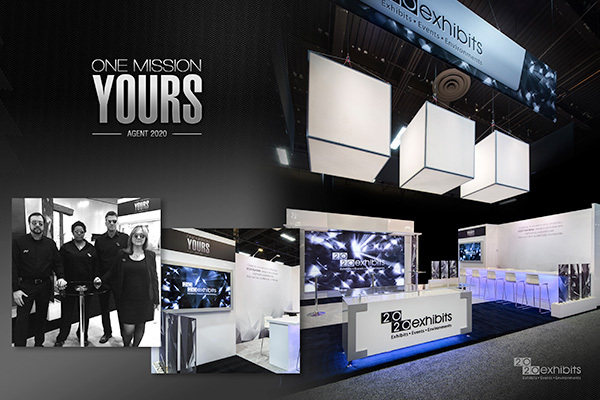 The creative building blocks were the foundation for a unique look and feel that would allow the ExhibitForce brand to shine. Imagination rules the world. An Award of Excellence was awarded in the Sales Enablement Category for 2020 Exhibits “One Source” capabilities brochure. To communicate the concept of gathering so many aspects of the organization into one piece, the theme of “One Source” was chosen. The idea was simple – to market the vast suite of offerings as a single turn-key solution. The design team differentiated the brand, spicing up the storyline and taking the reader on a “journey” through the organization with vibrant photography, large scale full bleed imaging, light copy, and plenty of branding graphics to capture the essence of the brand. In the Social/Interactive Presentation Category, an Award of Excellence was awarded for the Morgan Engineering custom interactive display. Designed for intuitive interaction, the custom interface gently guided the user to the information they needed and generated custom content that could be delivered straight to the prospect. On the back end, Morgan Engineering could accumulate valuable customer data to provide its business development team. The interface was dominated by a crisp, colorful touchscreen where users could choose from a series of icons according to the subject they were looking for or flip-thorough renderings from a catalog of images. The resulting design and program contained all of the key data the client wanted to be presented while maintaining a very smooth UX. In the Corporate Video Category, an Award of Excellence was awarded for the Danos “Producing Confidence” fabrication division video. Giving scale to the audience, drone shots became an invaluable resource, adding depth and dimension. The scope and cadence of the drone footage blended with production floor shots giving the viewer a true sense of the activity within the space. The voice-over provided the platform to deliver the critical core values messaging and was delivered via interview the company owner. Post production was critical to achieving the video’s objectives. Supers provided the facility and equipment specifications along with the safety recognition content. The cadence of the supers was timed to flow with the music selection to give an upbeat tone consistent with the overall theme and message.